"When we look at the lives of those who have faithfully followed Christ, we are inspired with a new reason for seeking the city which is to come"
(Vatican II, Dogmatic Constitution on the Church, 50). If Mary Magdalene was the victim of misunderstanding, George is the object of a vast amount of imagination. There is every reason to believe that he was a real martyr who suffered at Lydda in Palestine, probably before the time of Constantine. The Church adheres to his memory, but not to the legends surrounding his life. That he was willing to pay the supreme price to follow Christ is what the Church believes. And it is enough. The story of George's slaying the dragon, rescuing the king's daughter and converting Libya is a 12th-century Italian fable. 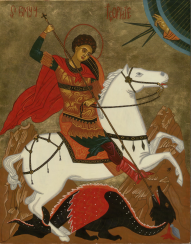 George was a favorite patron saint of crusaders, as well as of Eastern soldiers in earlier times. He is a patron saint of England, Portugal, Germany, Aragon, Catalonia, Genoa and Venice.